Pearls come in various colours from black, pink, white and cream and even different shapes, round, pear, oval as well as irregular shaped. Pearl jewellery is very popular from traditional classic’s to the more modern styles and whilst most people associate pearls with necklaces, they are also set in rings, earrings, pendant and bracelets. Pearl jewellery is timeless and that is why at Lester and Brown we always have a large selection of pearl jewellery to peruse at your leasure. The birth of a pearl is truly a miraculous event. Unlike gemstones or precious metals that must be mined from the earth, pearls are grown by live oysters far below the surface of the sea. Gemstones must be cut and polished to bring out their beauty. But pearls need no such treatment to reveal their loveliness. They are born from oysters complete — with a shimmering iridescence, lustre and soft inner glow unlike any other gem on earth. A natural pearl begins its life as a foreign object, such as a parasite or piece of shell that accidentally lodges itself in an oyster’s soft inner body where it cannot be expelled. To ease this irritant, the oyster’s body takes defensive action. The oyster begins to secrete a smooth, hard crystalline substance around the irritant in order to protect itself. This substance is called “nacre.” As long as the irritant remains within its body, the oyster will continue to secrete nacre around it, layer upon layer. Over time, the irritant will be completely encased by the silky crystalline coatings. And the result, ultimately, is the lovely and lustrous gem called a pearl. 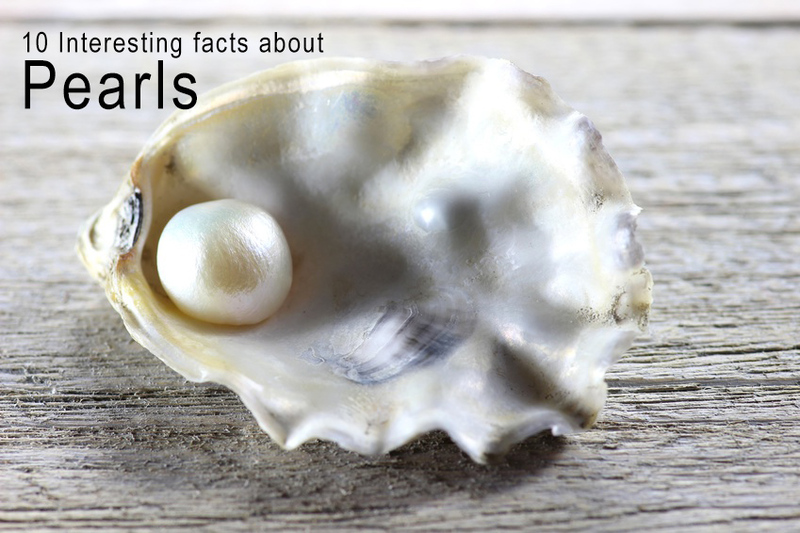 1: Pearls are the only gemstones in the world to have been extracted from living animals. While some oysters die after pearl extraction, there are mussels which remain alive even after the removal of pearls. And the collection of pearls has been around for over 4000 years. 2: Cultured pearls that are harvested from mollusks can be re-instilled to create pearls without killing the oysters. 3: The saltwater pearls, also known as the Akoya pearls are extracted from oysters, where as the freshwater pearls are collected from mussels. And not to forget, all the mollusks are capable of creating pearls. 4: These gemstones derive their distinctive colours from the inner elements of the shells, which range from white and ivory to pink, black, purple and even gold. 5: Every pearl is unique. No two are alike, and all have some imperfections. 7: The oldest pearl jewellery ever discovered was found in the sarcophagus of a Persian Princess who died in 520 BC. 9: Periculture is the term usually referred for cultured pearl farming. 10: In 1916, Jacques Cartier, one of the world’s renowned jewelers was able to purchase his 5th Avenue store by trading only two pearl necklaces in exchange for that plot. Like natural pearls, cultured pearls grow inside of a mollusk, but with human intervention. A shell is carefully opened and an object is inserted. Shapes of objects vary, depending on the final shape of pearl that’s desired. Over time the object becomes coated with layers of nacre. The depth of the nacre coating depends on the type of mollusk involved, the water it lives in, and how long the intruder is left in place before being harvested. As nacre thickness increases, so does the quality and durability of the cultured pearl.